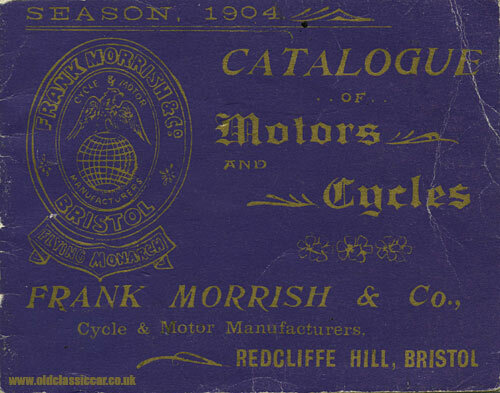 Flying Monarch motorcars, bicycles and powered tricycles by Frank Morrish & Co.
Homepage. This page: A look at the different veteran vehicles on offer from Frank Morrish & Co. of Bristol in 1904. Catalogue of Flying Monarch cars and cycles. "In presenting our Annual Catalogue of "Flying Monarch" Motors and Cycles, we take this opportunity of tendering our thanks to our customers for their support in the past. We are confident, with the acknowledged excellence and efficiency of all our 1904 models, that our field of business will be greatly extended, and that we shall establish a general satisfaction." The Gent's Bicycle, with Eadie BSA or Chater Lea fittings. The catalogue then goes on to describe each vehicle that the firm could supply. Firstly, there is a look at the Flying Monarch "Standard" Lady's Cycle, Model No.1, a loop-framed cycle in the veteran style "... carefully designed to give the Rider a graceful position" no less. For a price of £12 12 0 you'd get a 2 year guarantee, and a bicycle fitted with either 26in or 28in wheels, Eadie plated, with Dunlop, Palmer or another first grade tyre fitted as standard. Twenty two carat gold leaf or silver bronze lining was also included, along with back-pedalling brakes if required, and a free wheel, with Hyde's clutch. For an extra £1 10 0 the lady could avail herself of a second gear. The Flying Monarch "Road Racer" gent's special. On sale at £10 10s 0. The gentleman cyclist hadn't been forgotten though, as Model No.2 in the range was a gent's machine which came with either Eadie BSA or Chater Lea fittings, again with either 26in or 28in wheels. The gent with sporting pretensions could opt to cut a dash on a much racier model, if he so chose. The Flying Monarch "Road Racer" was a low-cut machine ".. built to suit the "Speedy Road" man, and it is very light, strong and fast". This cycle, with it's dropped handlebars and Brookes' Road Racing saddle, cost £10 10 0, and came equipped with either Eadie, Chater Lea or Abingdon fittings. A note at the foot of the page advises that "Our Mr Frank Morrish being a practical Cycle Engineer, and also a practical Cycle speed man, strongly recommends 26 x 1 1/4 Palmer Tyres, and handlebars not less than 18 inches wide on this class of bicycle". If Sir had a greater need for speed, then perhaps he'd opt for the "Path Racer", a similar machine to the Road Racer but with a steeply sloping cross tube, giving a much lower upper body position and less drag. If however the thought of pedalling furiously brought Sir or Madam out in a sweat, then perhaps one of Frank's motorcycles may have been more appealing. Not only was he a bicycle expert, he was also knowledgeable regarding the combustion engined market: "Our Mr Morrish is a practical Motor Expert, having turned his attention to the motor industry in its early days, and with constant study together with a practical experience, is now placed in the top rank of Motor Manufacturers and Experts, and customers can rely on his personal attention even to the smallest detail". 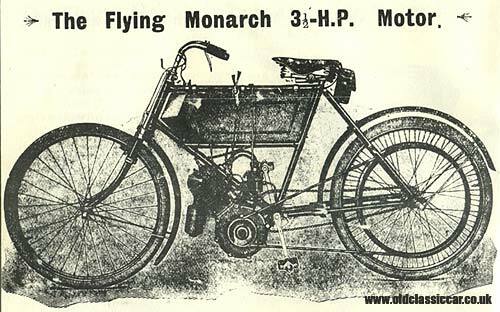 The Flying Monarch Twin Cylinder motorcycle could be ordered with either a 3HP twin, costing £45, or a 4.5HP twin at £55 all in. A respectable turn of speed was guaranteed: "These Motors are exceedingly fast and powerful. Will climb any hill at full speed and can be driven from 4 to 60 miles per hour". Falling inbetween these two machines, in terms of price, was the Flying Monarch 3.5HP model, recommended "for very hilly country". At £50, it came with a single cylinder engine and pedal-assist, as the scan from the catalogue below shows. A small note also advises that you could order a little 1.5HP motorcycle, for £30 0 0 all in. Included within all the quoted prices, were 2 accumulators, a motor lamp, horn, and "every tool and spare part necessary". If internal combustion was your "thing", but you weren't too steady on your feet or had many errands to run, then perhaps the Flying Monarch Motor Tricycle would be worth a look. They were recommended for doctors, commercial travellers, and anyone else who had to venture out on the road, irrespective of the weather conditions, as the combination of three wheels would overcome the danger of "side slip". Two versions were on offer, the 2 3/4hp model at £70, and the 2hp version at £65. Do any survive I wonder? Next, Model 8 in the catalogue, is another bicycle, this time with two speed gears as standard, followed by a pair of motor-powered cycles, both badged as "Minerva" for some reason. One has a 2hp single cylinder engine (£38 10s), the other a 2 3/4hp single (£45). Trailing cars were an option at an extra £6 6s upwards, as were sidecars from £12 12s. Forecarriages could be purchased for an extra £15. Interestingly, Morrish add that "all our Motors are reliable touring machines", and go on to state "No Racing Freaks", whatever that means. An example of the Minerva can be found on this page in the vintage gallery. In the early 20th Century, many cycle manufacturers were jumping onto the combustion-engine bandwagon, and producing their own automobiles, or Light Cars, as many of these small veterans were known. Morrish was no exception, and his offering was the Speedwell Light Car, a tidy two-seater priced at 125 Guineas. The car was "an excellent hillclimber", and came with a De Dion engine rated at 6hp. 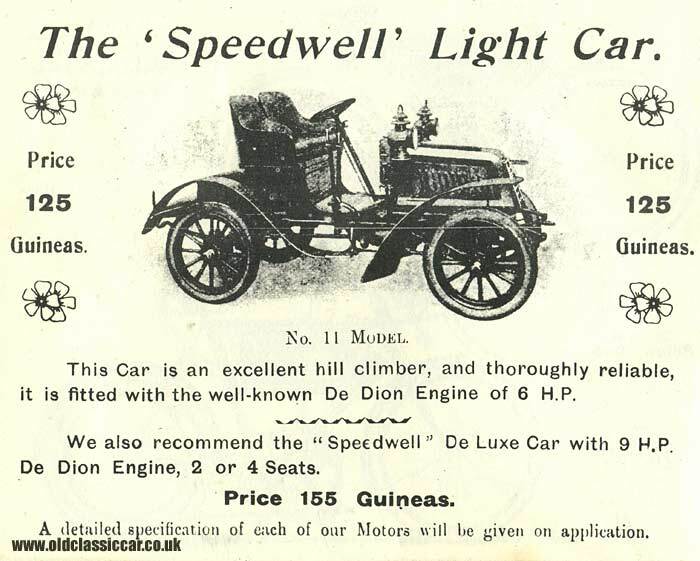 Shell out another 30 Guineas and you could instead choose the Speedwell De Luxe, which had a 9hp De Dion engine, with 2 or 4 seater coachwork. Perfect for the London to Brighton run, assuming they made any, and you could find a survivor! What became of this manufacturer, or indeed the man behind it? There were many many small firms just like this one at the turn of the 20th Century, experimenting with car and motorcycle production. Many swiftly fell by the wayside, and information about these early pioneers can be scarce. 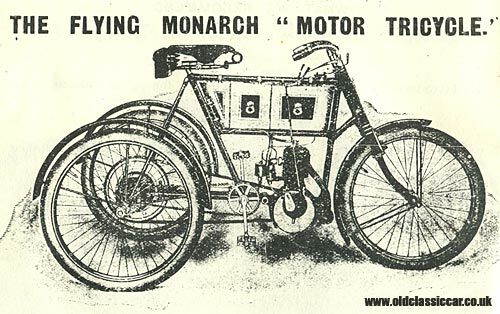 An online search brings up a few references to the Flying Monarch Cycle Co. of 1898, but is listed as a Coventry-based manufacturer - whether this relates to Frank Morrish and his range of Flying Monarch cycles and tricycles isn't clear. Equally there aren't too many references to Frank Morrish either, although one possible mention did turn up on a website that deals with awards and losses in WW1. There is reference to a Frank Morrish who was lost on HMS Defence, during the Battle of Jutland in mid-1916 - perhaps the same person? Return to the Motoring Miscellanea section, or for more information about elderly bicycles, please have a look at the vintage and classic bicycles section at OCC. Another almost-forgotten car on sale in 1904 was the Canterbury, please take a look at the Canterbury Motor Company page.